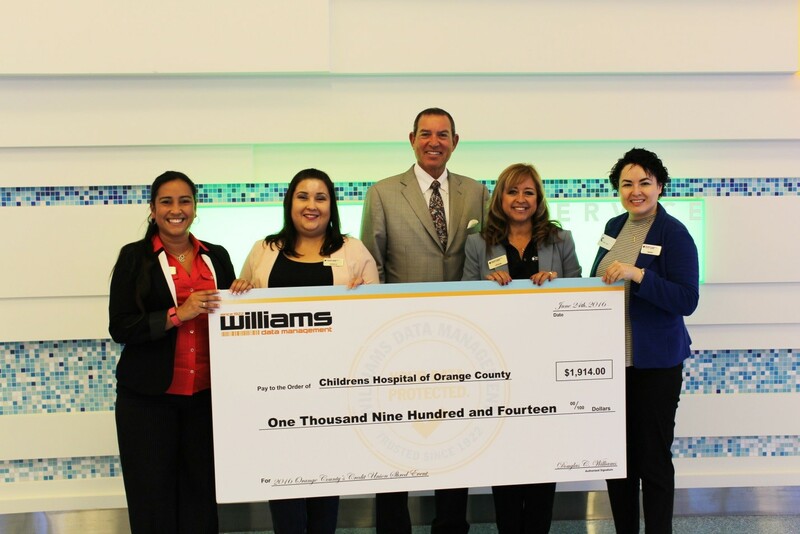 LOS ANGELES, CA July 13, 2016—Williams Data Management, Southern California’s leading Data Lifecycle Management services provider, announced a $1,914 donation to the Children’s Hospital of Orange County (CHOC). On June 24th, 2016 Douglas Williams, Chief Executive Officer of Williams Data Management presented the check alongside Leticia Mata, Assistant Vice President Community Education and Development at Orange County’s Credit Union. For the second year, Williams Data Management held its annual shred and E-waste event in conjunction with Orange County’s Credit Union honoring and supporting Orange County’s Credit Union’s charitable community efforts. The shred drive took place in Santa Ana, CA, where the public was given free access to shred and recycle their personal information and various E-Waste items. Just over nine tons of recyclable material was produced and for every ton recycled, Williams Data Management pledged to donate approximately $200.00 to CHOC. “Orange County’s Credit Union is an exemplary example of an institution dedicated to giving back to the community, and we are honored to be a part of that commitment,” said Douglas Williams, CEO of Williams Data Management. “CHOC’s facilities and care are an inspiration to the parents and children who rely so heavily upon them and we are grateful to be able to contribute to the aid provided by CHOC,” he added. Williams Data Management specializes in Data Lifecycle Management™. Operating in the Records and Information Management industry it has been serving businesses throughout Southern California since 1922. The company is committed to data protection and offers full-service solutions including physical and digital storage, document scanning and indexing, certified document and hard drive shredding, product destruction, business continuity planning, and Information Governance programs. Williams holds certifications for data compliance and destruction including SSAE16, NAID “AAA” Certification, and is a member of PRISM. More information: visit www.williamsdatamanagement.com or call 888-478-FILE.